How can I find a cheap undeveloped forested property in Western Washington (State)? I am interested in building a cabin in Western Washington. I would like to find a rural (read: very forested with few other properties near by) plot of land somewhere in the region. I am (as one might expect) wanting to pay as little as possible. My problem: I have absolutely no idea where to look for plots of land. I know Zillow.com for houses, but they list very few open plots. At first I thought perhaps foreclosure auctions, but then I thought that few undeveloped plots go into foreclosure. A whole lot of money to spend on this project. Please help me find a source! What you need to do is be on the ground in that area. The internet can provide some getting started information, but you need to go and look - and talk to people there. Fly out to Spokane for a few days. Visit as many realtors offices as you can. Call ahead to some realtors. When you talk to the realtors, give them proof of funds. Make it clear that you have the money and are a serious buyer - visit 25 realtors and get them looking for you. Check out things for yourself. If you just call, you will get shuffled to the not so important list. Going, being there, gets people moving for you. A year isn't necessarily a long time, especially if you don't have a lot of money and are looking for that perfect place. If you want to browse around, you might try landsofamerica.com or unitedcountry.com, but getting on the ground in that area will definitely give you a lot more leads. How much land are you thinking of? Just enough to build a cabin and have a tree screen (an acre or two)? Enough to not run into your neighbors all the time (some tens of acres)? Enough so you can pretend you don't have neighbors (dunno how much you'd need: a lot)? Do you want to be close enough to civilization that you could bring in power and communications in the future? You're going to want to look at a number of parcels in person before you buy one, so budget (time/money/effort) for that. There are a bunch of different regions you could be interested in, from the coastal area (Olympic Peninsula down though Gray's Harbor to Oregon), the rural parts of Puget Sound (Kitsap, San Juans, etc. ), the more agricultural regions south of that, and the increasingly hilly areas as you go west up the Cascades. You should probably figure out where you're looking among those, too. Each has a somewhat different climate, topography, and political atmosphere (remember in rural life you probably interact more with your neighbors than in urban life). Spokane is in Eastern Washington. You can search Realtor listings in SW Washington at www.rmls.com. I'd call some real estate agents in the counties you're interested in. My experience is that Realtor would be happy to send you that information. Watch out for land zoned 'recreational' because it is often not buildable. Second getting out there into the small communities. Talk to regular folks, there are many who have small parcels and in this economy there must be some that want to sell. You can search on redfin.com for land, by county. I don't think you should discount the foreclosure option. because you could miss something like the property we bought that is forested but had a house that burnt down but was not changed to "undeveloped" by the bank. It also had a large shed which we turned into a tiny house. Why do you have to have bare land? What if you buy a property that has a trailer on it or something? If you don't want to live there you could rent it out. I'm trying to say instead of looking for bare land you might want to buy a forested piece of land with a very ugly trailer or nasty house on it and then clean it up. Most people will avoid a property like that because of the work. We spent a year cleaning the property we bought but boy was it worth it! Plus you are young right? But only buy a fixer upper if it is the only crappy property in a neighborhood. Everyone will love you. We use this site: USA Foreclosure. They will email you when the property comes up for auction. I think you should choose a town you want to live next to first. To narrow down the search. May I suggest Bellingham? You need to go there. In Skagit county you would want to go to the Burlington area first, start talking to real estate agents. In that area you would be looking for something east of Sedro Wooley and up the North Cascades highway. In Whatcom county you'd want to hit up the realtors in Bellingham first. Then go out to Lynden and do the same. There aren't any significant realtors in the Glacier area, really, so anything listed would be listed with a realtor's office closer to "civilization". You can probably find some -very- rural properties off roads that are spurs of the Mount Baker Highway. 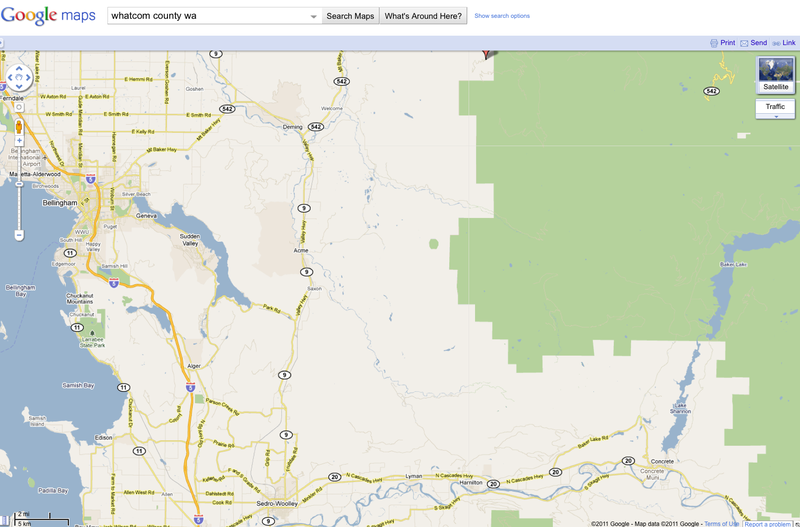 Start checking out Whatcom County on Google Earth and you will get a good idea of where roads exist and do not exist. Follow the Mount Baker Highway. One more thought on the Google Earth part: Use the 3D features of Google Earth! Wait until all of the mountains have rendered and then tilt the view. On the western side of the Cascades, the areas where roads exist (in conditions passable by a Subaru or light 4x4) are constrained by geography and mountain valleys. One approach would be to look into local land trusts that might be selling land to "conservation buyers". A typical scenario might have a parcel that is mostly under conservation easement but has a section of it that that is suitable for home development (and not under protection by the land trust). This would allow you to have a cabin on a remote piece of land that is permanently protected from development and thus will maintain more of the isolated feeling you desire. Potential downsides include restrictions on what you can do on your land (the land trust may not allow timber harvest on the protected portion of the parcel) as well as potential limitations on where the cabin may be (the land trust may not want to allow for it to be immediately adjacent to a stream, for example). However, there are potential tax breaks and other benefits to this arrangement as well. Also, conservation easements vary from land trust to land trust and are generally negotiable as well. It may be worth looking into. Here's some general info on conservation buyers. This link may help you find a land trust.